Immerse yourself in St Ives life and stay in coastal luxury at Sandpiper. 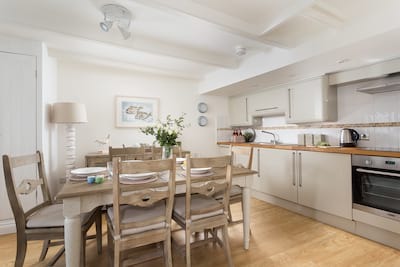 This beautiful stone townhouse offers the perfect central base for family and friends to explore West Cornwall and enjoy the enviable location in the heart of the town. 3 beautiful ensuite bedrooms, a cool kitchen and elevated open plan living space create a home-from-home for up to 6 guests. Sandpiper has been thoughtfully styled briniging a touch of contemporary glamour to this traditional house. Private off road parking. A maximum of 2 dogs welcome. Set in a prominent location overlooking the characterful rooftops and blue bay of St Ives, Sandpiper is a wonderful stone townhouse recently transformed to the highest standards. Open your holiday door to a welcoming relaxed ambiance where original period features blend flawlessly with more modern order. Set across the ground floor are two stunning bedrooms, to the front is the beautiful Super King master bedroom furnished in soft creams and country French inspired furniture with relaxed armchair, perfect for a mornings coffee-with-a-view. The large ensuite wetroom completes the luxury feel. To the rear a further Super King (zip/lock) bedded room with ensuite shower room. A central staircase leads from the hallway to the first floor. Achitecturally designed, this space has been cleverly mapped out to create a generous open plan footprint from the front double windows to the rear of the house. This wonderful elevated space is flooded with natural light and offers a holiday hub for guests to relax on the comfortable sofas. Dress the dining table up for celebrations or keep it simple for lazy lunches and indulgent brunches. The kitchen is cleverly tucked away (just 3 steps down) yet still retains the open plan ambiance, think New York loft style with the vaulted exposed wooden beams. 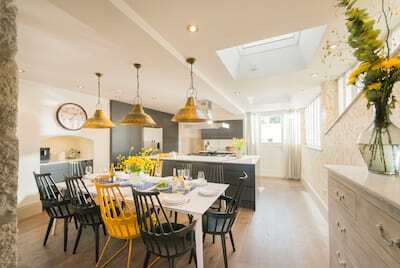 This ship shape kitchen is fully fitted with top of the range appliances and offers ample preparation and storage space for your Cornish fare. From the living room, a door leads through to the 2nd floor staircase. Climb to the penthouse level bedroom with King bed and contemporary style ensuite shower room. From the moment you arrive this impressive holiday home-from-home oozes style from the unique and inspiring artwork handpainted by the owner, the cool fabrics and prints of the soft furnishings to the thoughtful layout. Accessed from the ground floor bedroom one ensuite and master bedroom ensuite is a small gravelled courtyard, an enclosed space offering the perfect storage for holiday and beach kit. To the front of Sandpiper is a wonderful outside seating area with built in bench style seating and a wooden dining table. Choose to dine al fresco as the sun sets below the bay or catch the mornings rays as St Ives comes to life. Original granite steps lead down to the parking space just below the house. Wander from your door and into the bustle of this charming town within minutes. A plethora of trendy cafes and bars offer a tempting rest stop or indulge Cornish style in any of the local restaurants. If a day on the beach is on the cards then pack up and head to Porthmeor Beach, a surfers top spot, or choose the more sheltered waters and white sands of Porthminster Beach. The picture perfect harbour combines the working fishing boats, day cruisers and kayakers alike all enjoying the azure blue seas of West Cornwall. Whatever the occasion, whatever the season, bring family life together at Sandpiper. The parking space measures 3.4m wide and 3.5m deep. The house is set over 3 floors. We loved our stay. A fantastic location and a lovely spacious house. We would return in a heartbeat. I would not hesitate to recommend Cornish Gems. The customer service and property were both excellent! A very special restful time. The house is very nice, location and facilities were excellent. A lovely new year holiday in St Ives! We were very pleased with the standard and presentation of the property and will definitely consider Cornish Gems again for our next family holiday in Cornwall.